We are able to supply and manage any make of car or commercial vehicle. 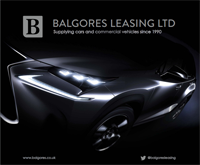 We advise on the best option for you whether new or nearly new.Balgores Leasing Ltd was established in 1990 and has developed into one of the most successful contract hire brokers in the UK working closely with ALD Automotive, Alphabet, Arval, Hitachi, Lex Autolease and Santander. Relationships have been forged with all major motor manufacturers ensuring our customers benefit from the very competitive buying terms negotiated. Various finance packages are available including Contract Hire, Lease, Lease Purchase, Contract Purchase & Hire Purchase. All of the above can be offered with full maintenance. Whatever modifications your car or commercial vehicle requires we can arrange it, including ply lining, roof racks & shelving, security locks, tow bars, sign writing, alarms & trackers and refrigeration. Balgores Leasing are a credit broker not a lender. You might notice that we don't have extensive lists of prices based on unrealistic terms. However, we can provide any vehicle, so please get in contact with a member of our team to discuss your individual driving requirements, including expected mileage, upfront payments, CO2 emission requirements, duration of lease, vehicle extras, and whether you want maintenance included, amongst other specifications. With over 75% of our business coming from existing customers and referrals, we're confident you'll enjoy this level of service.